Much to the elation of citizens of left-leaning Portland, Oregon, a jury of six acquitted five silver-haired activists; four women and a man aged 56 to 76 of misdemeanor criminal mischief charges, Thursday, December 13. 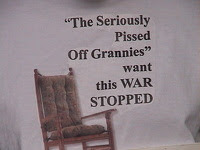 The group, calling themselves “Seriously Pissed Off Grannies,” was charged in connection with vandalism of a US Army Recruitment Office in Portland. Typically seen sitting in rocking chairs and holding their protest signs, the group decided to do something more radical earlier this year when they left red handprints on the front window of the Recruitment Office, along with the number 3,627, the body count of American Troops killed in Iraq at that time. 30 minutes later, the group was acquitted. Apparently relying on their gray haired look and reliving what they consider the glory days of the 1960’s anti-Viet Nam protests, this small group feels acts of vandalism on their part is okay, forgetting that they are interfering with someone else’s free choice, a much lauded privilege and right touted at abortion clinics across the land. That they were acquitted so rapidly in Portland, Oregon should come as no surprise to any one. Portland, if you will recall from March of this year, is where protesters were chanting “Build a bonfire, Build a bonfire, Put the soldiers on the top. Put the fascists in the middle, and, we'll burn the f**king lot,” and “Bye bye GI, In Iraq you’re gonna die,” while burning a US Soldier in effigy. Also on the same day, another protester defecated on a burning American Flag in the street, in full view of others including children. Ms. Odom also claimed that the “grannies” considered using their own blood to leave red handprints on the windows, but decided to use water-soluble tempura paint instead. Perhaps Mrs. Odom hasn’t yet recognized that their tactics have “PO’d” another group of grandparents who she and her ilk denigrated and defamed 35 years ago and who aren’t going to allow it to happen this time. Great maddening piece Lew. We have those same stupid grannies in my little town. On nice days in the summer they take over the square with their stupid slogans and the placards. 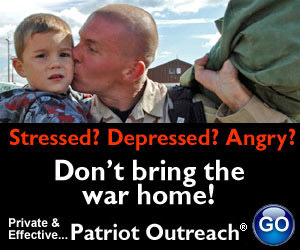 One of them approached me one time and asked me if I'd like to sign a petition agains the war. "Against the war?" I said. "Are you crazy? We need MORE WAR! not less war!" The poor old lady looked thoroughly confused and they never bothered me again. Stupid, uniformed old hippies. Think because they're old they have certain privileges -- like being loudmouths and being wrong. Or destroying other people's property or ruining their nice summer days. I hate the old bags. Actually, Roger, I'd call them "professional protesters" due to their admitted history of protesting. It sounds like the trial wasn't about the vandalism and obstruction of the office, but about everything else... shame on the attorneys and the judge fot disrespecting our justice system that way. they just make me furious.